● Readout in Siemens (e.g. “mS”) or CF. Avoid meters that will only yield TDS (ppm). ● A waterproof housing is desirable. However, this feature is generally not available on more sophisticated meters. ● Temperature compensation: A built-in temperature sensor and computer algorithm adjusts readings to display what the conductivity would be if the temperature was at 25OC / 77OF. 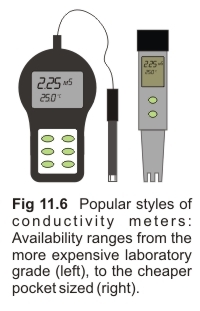 CONDUCTIVITY (EC): Using EC to control nutrient concentration | What is Conductivity (EC)?